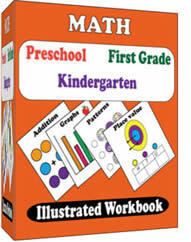 Premium Math workbook for beginners - Pre-K to 1st grade. Math Activities for Preschool; Math Practice for Kindergarten; Math Exercises for First Grade .We have resources for teachers and parents of Preschoolers, Kindergarten and First Grade Learners. All of the resources are designed to be useful in many K-6 classrooms and homeschool teaching. We have free Video Tutorials, Printable Worksheets, Interactive Games & Quizzes on : Addition, Counting, Subtraction, Fractions, Division, Geometry, Shapes, Graphs, Multiplication, Telling Time, Money, Phonics and More.